The Children’s Creativity Museum (CCM) is a place that not only encourages creativity and collaboration with their visitors, but also their employees, interns, volunteers, and anyone else passing through their doors. I’ve even watched as parents, inspired by our mission to build creative confidence, proudly display their own work or leave with their own creations in hand. In a time when much of the professional world is filled with bosses, companies and organizations telling you exactly what to do and how to do it, it is inspiring to enter into the world at CCM, where individuality and creativity are encouraged. Here everyone’s ideas are valued and incorporated. It is not just our mission, it is our culture to inspire creativity, encourage collaboration, and support communication. I started at CCM as a part-time intern and thought that through fulfilling the internship I would gain experience for my future career. I wasn’t prepared for just how valuable the experience would be. It is hard not to be inspired in an atmosphere that encourages creative problem solving and original thought, especially when your opinion is valued all the way to upper management. I am now a full-time educator, running educational programming and teaching design thinking to students and teachers. About 6 months ago, I decided to tackle my own creative design challenge. 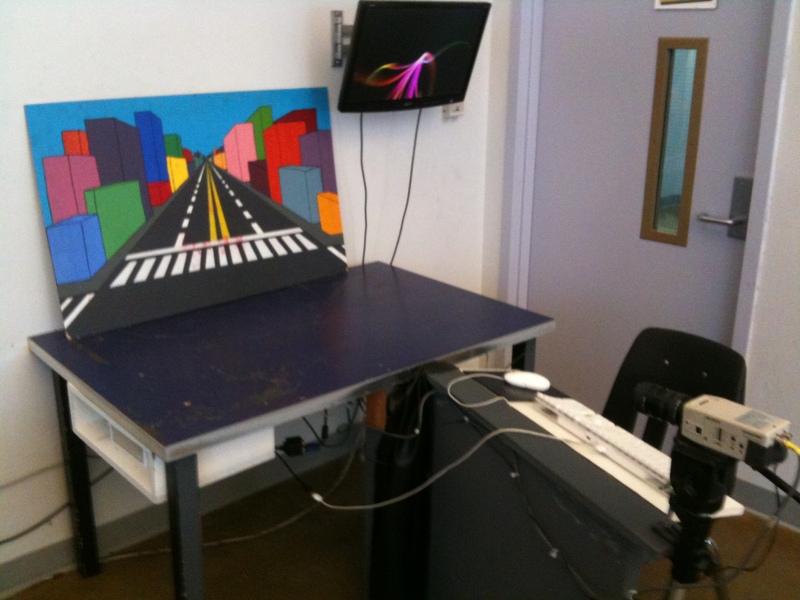 Our animation stations were falling apart and were hazardous to the success of children’s creativity. The problem was clear and I was full of ideas on how to fix it. With the design thinking process in mind I embarked on an ambitious project to redesign the animation filming stations. Little did I know the challenges I was about to face, how hard it would be to work within the constraints and how I would watch my deadline come and go with a prototype I had yet to deliver. Empowered by the museum’s mission, I was brimming with creative confidence. With a mockup of collaborative ideas I called the one designer and engineer I knew best, my father, who would support my ambitious goal to help this museum fulfill its mission and launch it into the future. 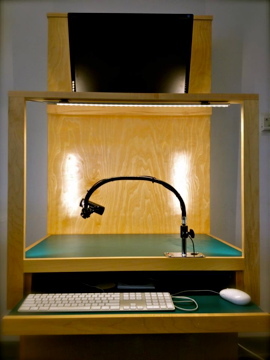 I was determined to deliver CCM their first prototype of a new animation station that was not only functional for the daily visitors, but also for educational programming. I was going to build this vision and I was going to do it all within my limitations of little time and very little money. Something that gets tossed around on a daily basis here at CCM is “design thinking,” which is a creative process for problem solving. There are no judgments early on so that fear of failure is eliminated and the generation of ideas is maximized, which then leads to prototyping. It is a process broken into five steps (empathy, define, ideate, prototype, and test) that encourages thinking outside of the box and leads to creative solutions. I began this design process already a step ahead. I had empathy. I had been using the animation station for the last several months, struggling with its less-than-perfect design to lead groups of 30+ students through clay animation classes. I observed as children and parents encountered the flaws in the design – wires were pulled out of the camera, power cords unplugged, cameras and stages bumped, network failures. Anyone that has ever worked with children knows that one of the most heartbreaking things is to tell them that something they have created, put work and thought into has been lost or destroyed. I asked my dad to come to the museum so he could see firsthand what an animation station was and how it was used. During his visit he was able to see the problems encountered on a daily basis. Armed with our insights and clear that the problem was within the design of the animation stations, we were ready to move directly into brainstorming a new design. I spent two months going over designs, scanning and emailing with my dad, and showing coworkers the iterations during the progress of the design to get their input. I drove all over the bay area researching cameras and mounts, trying to explain my vision to fabricators, retailers and experts across a variety of fields. In this moment I learned how easy it is to have an idea and how hard it can be to execute it. After hair pulling meetings and hearing more ideas and viewpoints than I ever could’ve imagined, I finally found parts I could afford and a design most people agreed with. It was time to start building! 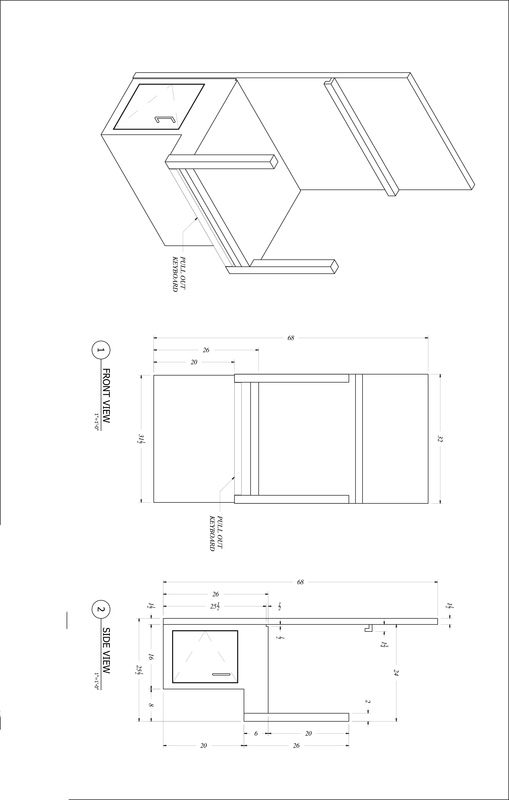 I needed to build this animation station prototype, a design that I had been toying over for months, but how would I do it when I was still working within the constraints of a very tiny budget and limited time. My weekends for the next month (along with my designer/engineer dad) were consumed with visits to hardware stores, lumber yards, fabricators and even his personal tool shed. I needed materials that would be durable and I needed them cheap. After carrying my calculator through countless stores, my dad suggested that it might be time to turn to a fabricator and ask for help. That’s when a meeting with a local wood products store in Northern California changed everything. I came in to the meeting fueled with passion to express my idea with the hope that maybe Jeff, the owner, would have a suggestion or be able to point me in another direction. Instead, he looked at our design and agreed to build the first prototype. 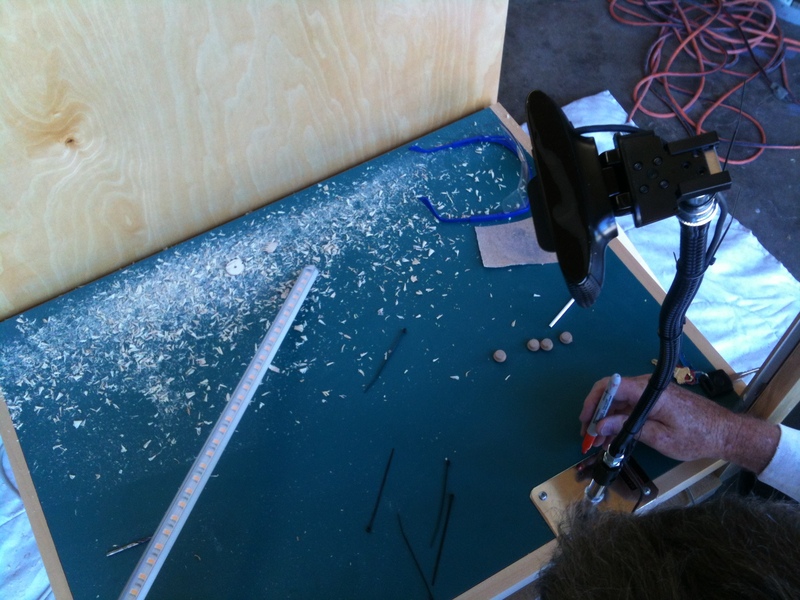 Using scrap materials, Jeff built our animation station within our budget. Over the next several weeks my dad and I worked to install all of the pieces of the station, fastening all of the various pieces I had collected. Finally, a month and a half over my deadline, I had a prototype to deliver! It wasn’t perfect and I could already see the flaws, but it was the start to a new future for the museum. I couldn’t wait to deliver it and show the museum, not what I built, but what was possible with a lot of thought and determination. Over the summer the prototype was put to the test and used by groups of children of all ages, families, and staff. The flaws I saw in the beginning played out to be real problems and improvements needed in the design. That’s the beauty of a prototype, I was able to take all of our ideas and put them to the test. I witnessed as some features of the prototype were praised, while others received mediocre reviews, and other aspects failed completely. And now it is with all of those observations and feedback from visitors and staff that I am back to the drawing board. I am determined to see this project through to the end. Not only because I want to see its completion, but also and more importantly because I believe in what it will enable. Students from all over Northern California come to CCM to build their creative confidence and are given the freedom to express themselves. Clay animation brings to life lessons in photosynthesis and astronomy, promotes reading comprehension in the works of Robinson Crusoe and Harry Potter, and brings to life historical tales such as Abraham Lincoln and the Civil War. Children are inspired to create with a medium that is inviting and playful in an atmosphere where failures are embraced as learning opportunities and constraints inspire creativity. I am proud to be a part of CCM, where our philosophy of “having the freedom and courage to fail/take creative risks and the knowledge that all of the ideas you create have value” takes the forefront. Through our culture and mission, I developed my own creative confidence. I was able to take a creative risk and I hope to be able to inspire our visitors to do the same.